See all your email templates at a glance Templates will be displayed in a multi-level tree, and you will see text of the selected template in a preview window. 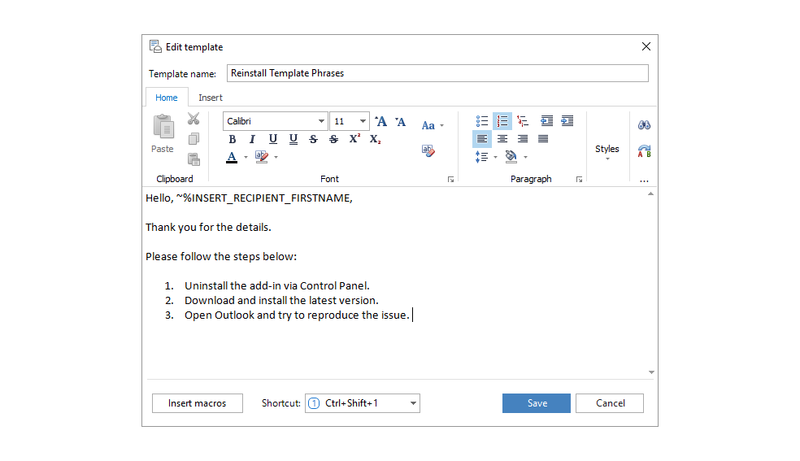 Share your Outlook templates with co-workers Drop your templates to a shared network drive and create company-wide templates. 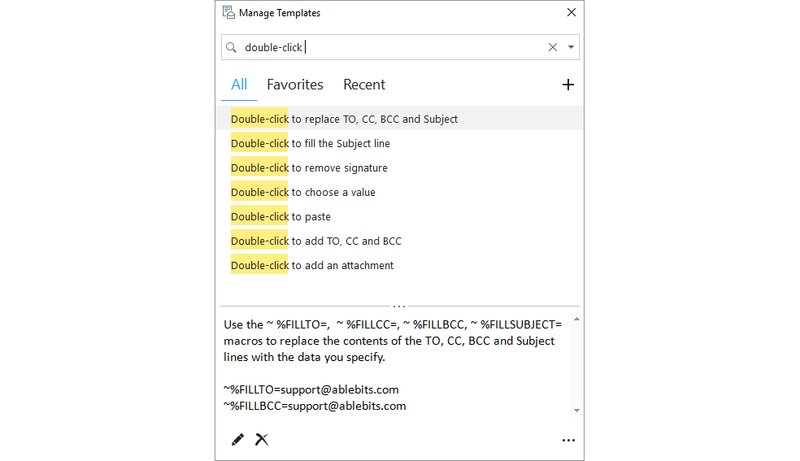 Insert text in Outlook with a shortcut Assign shortcuts to most frequently used templates and get them inserted instantly into Outlook emails. Export or import template phrases Import and export all your templates or a selected folder with a mouse-click. Get feature-rich formatting for HTML templates Add basic text formatting to your templates, insert pictures, signatures and hyperlinks. Fill message fields with template macros Select a macro from a list and do not waste time on things that you do manually dozens of times a day. Have favorites and recently used templates at hand Arrange the most frequently used templates and pick your favorite wordings in an instant. Instantly search in email templates With incremental search you can find the needed email template by entering a few letters into the search field. What is Template Phrases and what do I need it for? Template Phrases for Microsoft Outlook is a useful tool for anyone who extensively uses e-mail in their daily work, from technical support personnel to sales managers. All you need is to create a template once and then you can freely insert this text into your Outlook messages. How to use Template Phrases for Outlook? Download and install the Template Phrases for Microsoft Outlook plug-in. Create a new message or click Reply. In the Microsoft Outlook message window, you will see the Template Phrases pane. Select the frequently repeated text snippet. Click on the New template button in the plug-in's panel and give a name to the new Outlook email template. Please find more information here. Can I share my templates with colleagues? Yes! 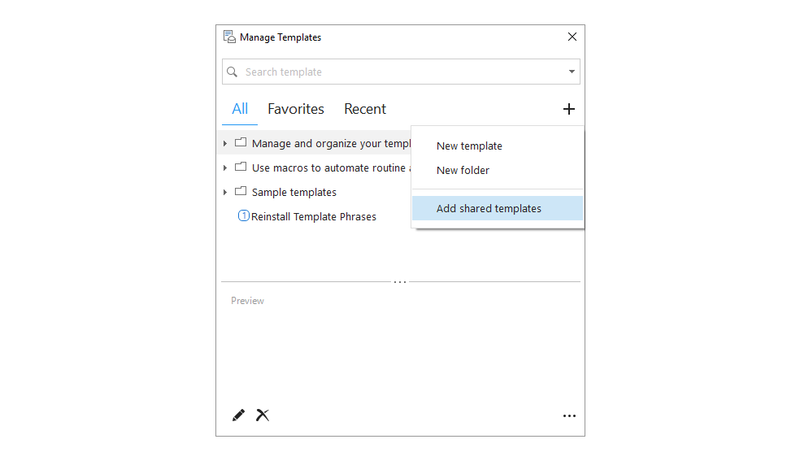 If you work in a team and want to share your Outlook templates with co-workers, just drop your templates to a shared network drive. Can I use formatting for HTML mail templates? Sure. You can add basic text formatting to your templates - bold, italic, bullets, headers, etc. Insert any pictures, signatures and hyperlinks into your templates and edit their text the way you are used to. Is it possible to use macros? Yes. You get a pretty good set of template macros to automatically add BCC/CC recipients when replying to your emails using templates, request Read or Delivery receipts, etc. You can also benefit from a macro that will prompt you to enter a given value every time you paste the template or pre-populate a value selected from the drop-down list. E.g. the time or date for a meeting template and so on. Can I use shortcuts to insert templates? Sure. 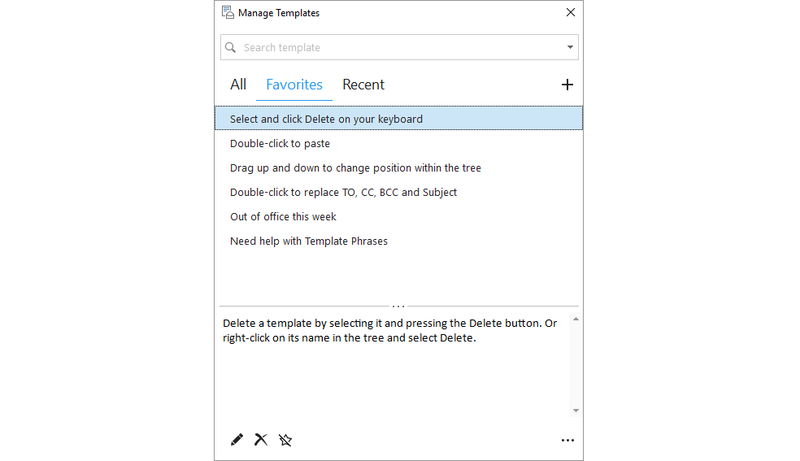 Assign shortcuts to most frequently used templates or save time by automatically inserting text of a template into all new Outlook emails, replies, or forwards. Can I export and import template phrases? Yes, you can. Import and export all your templates or a selected folder with a mouse-click and access your templates on several PCs. How to find the template I need? Easily. 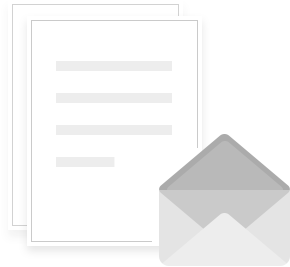 With incremental search, you can find the needed email template in no more than a second. You simply start typing the keyword or keywords on the Search tab. As you type, all templates containing this word or its part appear in the Template Phrases for Outlook pane. Just double-click the needed name to use this template in your reply. Is it possible to have favorites and recently used templates at hand? Sure! With Template Phrases you can arrange the most frequently used templates so that you can pick one of your favorite texts in an instant. You can also see the most recently inserted templates or sort them by name or frequency of use.